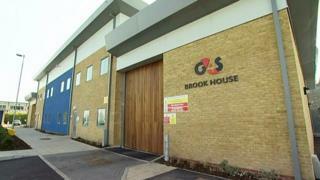 Image caption Staff at Brook House detention centre were filmed physically and verbally abusing detainees. The Home Office has "utterly failed" to ensure the safety of people held in UK immigration detention centres, a damning report says. MPs on the home affairs committee warn there are "serious problems" in almost every part of the detention system. They want to see an end to indefinite detention and much more done to protect vulnerable detainees, for example those who have been tortured. The Home Office says it is moving "further and faster" with reforms. The committee began examining the issue after a reporter from BBC Panorama filmed staff at the Brook House detention centre physically and verbally abusing detainees. Since the Panorama programme was broadcast in September 2017, 15 of the 21 staff allegedly involved in the incidents have either left G4S, resigned or been sacked. The committee says the uncovered abuse was "not the first of its kind", and urges the government to ensure immigration removal centres have safe and humane management, high quality healthcare and effective whistle-blowing procedures. It accuses the Home Office of having a "shockingly cavalier attitude" towards detention. The report calls for a 28-day limit on detentions, saying it is "unacceptable" that due to bureaucratic inefficiencies some people are detained for more than three years. It says policies that should prevent "unlawful detention" of vulnerable people are regularly applied in a way which means they are not being afforded the necessary protection. The report speaks of an "institutional culture" which prioritises the use of detention "as a means to enforce removal", above respect, dignity and the protection of vulnerable people. Kingsley Newuh, 39, is a political asylum seeker who has been detained at Morton Hall detention centre twice. Morton Hall is run by the Prison Service on behalf of UK Border Agency. Mr Newuh, who campaigns with Movement For Justice, says he came to England on a student visa, and due to the nature of his research - which criticised the government of Cameroon - he was told he would face imprisonment, should he return to the country. He says he found the detention process "terrifying" and started feeling "anxious and depressed" by the time he was released, three months later. He claims people died in the detention centre while he was there, saying: "I felt like a lamb to the slaughter. No one told me how long I was going to be there for - that was the most tormenting aspect of it, the fact I didn't know." "It's a prison under a different name. It was unsanitary, very, very dirty and I was locked in my room from 8am to 8pm." The Home Office denies detaining people indefinitely, arguing that the "law does not allow it". A spokesman said: "Most people detained under immigration powers spend only short periods in detention. "We are looking closely at the issue of time limits to understand how we can have a detention system that is fair to those who may be detained, upholds our immigration policies, and acts as a deterrent to those who might seek to frustrate those policies." The report doesn't use the phrase "not fit for purpose", but it might as well have done. That was how John Reid described the immigration department he inherited as home secretary in 2006, after 1,000 foreign prisoners were freed without being considered for deportation. The scandal sparked a tougher approach towards immigration enforcement, with more people rounded up for detention and removal. Now the concern is that detention is being used too often, and for too long, in a system which remains dysfunctional. But there are tentative signs, evident in the Home Office's response, that ministers are aware of the problems and may be prepared to act. Labour MP Yvette Cooper, who chairs the home affairs committee, said the Home Office's approach to immigration was "careless and cavalier", arguing that reform was needed urgently to ensure the detention system was fair, sensible, transparent and humane. She said: "Making the wrong decision on detention can have a devastating impact on people's lives - as we saw from the Windrush scandal, but also from many other cases we have seen. "The lack of any time limit and of proper judicial safeguards has allowed the Home Office to drift and delay, leaving people stuck in detention for months who really shouldn't be there at all." What is an immigration detention centre? Removal centres are used in cases where people have no legal right to be in the UK but have refused to leave voluntarily. They may hold asylum seekers who are awaiting decisions and people whose claims have failed and are awaiting deportation. A minority of detainees are foreign national prisoners who have completed prison terms for serious crimes and are being held in detention while steps are taken to remove them from the UK. The Home Office has 10 immigration centres in England. The Windrush generation is the name used for an estimated 500,000 people from Caribbean countries who arrived in the UK between 1948 and 1971 and were granted indefinite leave to remain. However, following changes to immigration law, many who arrived as children found themselves later unable to prove their status and some were subsequently held in detention or removed - despite having lived in the UK for decades. Olu Adekunle, 47, became a refugee in the UK last year - after four years and three judicial reviews - and spent time at three different detention centres. He had claimed asylum after escaping persecution from Nigeria because of his sexuality. Mr Adekunle said: "I felt like a criminal. You don't know what's going to happen to you." He said he believed the UK immigration system assumed claimants were lying and were "guilty until you prove you're innocent". He recalled a time when he was "chained like a dog" during a hospital visit, and says that although he is now a refugee, he still suffers from anxiety. The Home Office says it is looking closely at the issue of time limits to "understand how we can have a detention system that is fair to those who may be detained, upholds our immigration policies, and acts as a deterrent to those who might seek to frustrate those policies".